It’s no secret that my family loves pancakes. Most Saturday mornings you will find me making homemade pancakes with my daughter. I haven’t cooked with teff flour before. I don’t know what took me so long to use this incredible grain!! I was truly impressed with the hearty flour. 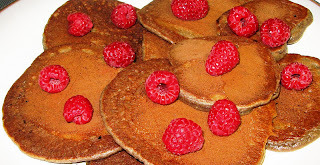 Indeed teff flour was a perfect addition to the pancakes. Raspberries are rich in antioxidants, manganese, Vitamin C, fiber and folate. Teff is the smallest grain in the world and native to Northeast Africa. Teff is a good source of calcium, iron and protein. 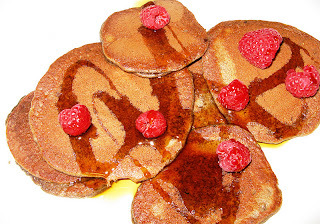 These pancakes are brimming with fiber and also happen to be delicious. Puree ingredients for several minutes. Grease griddle with 1 Tbsp. ghee and then heat to 350 degrees. Pour 1/4 cup batter onto griddle per pancake. Cook 2 minutes and then flip pancake and cook for another 2 minutes. Serve hot. I recommend sprinkling additional fresh raspberries on top and spreading some maple syrup and/or raspberry jam on top. This recipe is linked to Things That Make You Say Mmm, Living Well Blog Hop, Show it Off Party, Get Your Craft On, Inspire Me Monday, Tasty Thursdays, Pennywise Platter Thursday, Tastetastic Thursday, Strut Your Stuff Saturday, Anything Goes Linky, Fresh Bites Friday, Lunchbox Love, Freaky Friday, Fight Back Friday, Cara’s Cravings, Friday Food Flicks, Feature Friday, I’m Lovin’ It, Friday Favorites, Foodie Friday, It’s a Keeper Thursday, Transformation Thursday, Strut Your Stuff Thursday, Let’s Do Brunch, Tip Me Tuesday, Delicious Dishes, Traditional Tuesday, Tasty Tuesday Party, More The Merrier Monday, Market Yourself Monday, This Week’s Cravings, Farmers’ Market Recipes, Sunday School., Melt in Your Mouth Monday , Real Food 101 , Monday Mania , Latest and Greatest Friday and A Gluten-Free Holiday. These pancakes sound delicious! I haven't cooked with teff flour before so am excited to give it a try. Heard the results are fantastic! Thanks for the nice comment. I highly recommend cooking with teff flour-I think you will love the results. Your website and recipes look GREAT! Hi! Came over from Market Yourself Monday…This looks really yummy. Would love for you to come over and share at my Tasty Tuesday Party going on now! Thanks Emily. I posted it to Tasty Tuesday Party 🙂 I look forward to all of your great ideas on your site! These look wonderful, and I am sure the almond flour gives them a lovely flavour too. Thank you for sharing this recipe with Let's Do Brunch. It was my pleasure April. The almond flour does give them a great taste and a nice boost of protein and vitamins too! This looks wonderful! I have not used almond flour, but I have really enjoyed playing around with teff. Thanks for sharing this post on Friday Food Flicks! Amazing recipe Laura! Great job! I will have to try these…never thought about putting raspberries inside the batter. Very clever indeed!! Almond flour is really versatile when it comes to baking and packed with protein. I'm a big fan of it! Raspberries are my favorite fruit and I've never tried them with pancakes, but how yummy does this sounds 🙂 I'm pinning it! I have never heard of teff, but as I am getting more into G-F cooking (by choice not by force), it's fun to learn about new-to-me items. The pancakes look yummy. Thanks for sharing! Thank you so much! You will love teff flour-it's so hearty and nutritious!